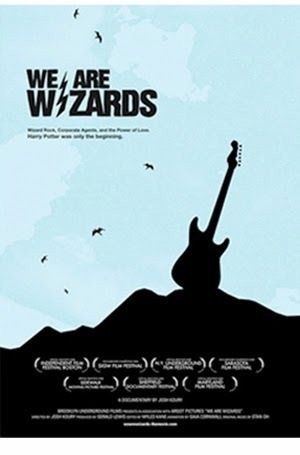 Over the past week, I've been watching We Are Wizards, a 2008 documentary about Harry Potter fans. Despite only being 78 minutes long, it took me quite a while to watch it because I had to keep turning it off and walking away for an extended period. The documentary itself isn't that bad, but the film-makers chose to focus largely on fans that had formed Harry Potter themed bands. And the bands were... not good. Really not good. I had to keep stopping the movie because I couldn't listen to their music any longer. Now, I don't care for the Harry Potter stories personally, but I can appreciate that a lot of people get a lot out of them. And that it got so many kids to read is absolutely fantastic! And while comics, for whatever reason that I haven't quite fully understood, hasn't generated many themed bands, I get why a group of folks would get together and express their love for a story or character through music. My buddy Ray Wall has done exactly that, in fact, and is one of the few comic themed musicians out there. One of the cool things about fandom is that it encourages outlets for people to express their creativity. Even if you have a day job that feels monotonous or boring or unchallenging, you can use fandom as a release by writing or drawing or sewing or whatever. You don't have to be formally trained. You don't have to share your work if you're not happy with it. You don't even have to complete anything. It's just a form of expression that you can utilize however you like. You can create exclusively for the sake of creating, or you can create in order to share and connect with others. Another one of the cool things about creating within fandom is that it gives people something to build off. A lot of people are intimidated by a white page or a blank canvas. By starting within a fandom, you've got a built-in set of tools to work with. You've got a cast of fleshed-out characters, you've got a story (if not several), you've got a theme (if not several). It's much easier to get to a completed project if somebody starts by giving you "Harry Potter in a good versus evil battle against Voldemort." But that bit about not needing training? That means that a lot of fans who create stuff just aren't very good. Their language may be clumsy, or their linework is sloppy, or they don't know enough about the materials to know how to work them properly. And that's okay. Because it's (usually) not about trying to be a professional; it's about expression. It's not the end product that really matters, it's the emotions that are poured into it. Which means that, for however many bands that are out there based on Harry Potter (or comics or whatever), a good number of them are going to be bad. And that is totally cool. Like I said, it's about the expression. But damn, if you're going to make a full documentary and focus on bands like that, couldn't you pick one that was, you know, decent? I'm trying to watch and learn about Harry Potter fans to see what might apply to comics fans, but I keep getting wrenched out of the narrative by this terrible music. I mean, just musically, it wasn't very good. Maybe a few licks of a bad song here and there might be tolerable, but geez, there's only so many can't-carry-a-tune singers I can listen to. I checked out some reviews of the documentary afterwards, and it seems to fall into a general "meh" category. Not a great documentary, nothing really insightful, but not terrible either. I saw one commenter who noted that it was okay, but he felt the film-makers didn't really have anything to say; there was no real take-aways from the movie. But as I sit here and think through it, as much as I couldn't stand listening to that music and kept wishing they would've pick at least one band with some talent, it occurs to me that maybe that's exactly the point. Maybe that was what the film-makers were trying to say. That these crappy bands were doing what they were doing out of love for Harry Potter, and they weren't polished or professional, but other fans loved them anyway. Because they were on stage sharing their passions. And even if that wasn't a deliberate messages on their part, it's not a bad message for fans of all sorts. Whether you're into Harry Potter or Batman or My Little Pony or Naruto, you need to get out there and find how to express your love for it. Use that to connect with everyone else who feels the same way. Maybe it's through writing or art or cosplay or juggling or poetry or sculpture or music. Regardless, go take your place on the stage.